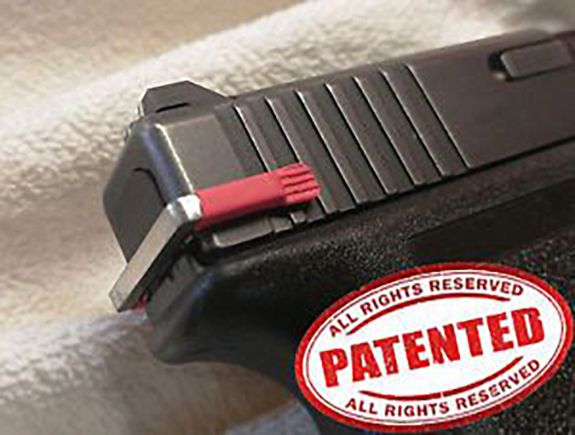 This revolutionary Glock accessory allows the user to repeatedly press the trigger on a Glock handgun without having to rack the slide to cycle the handgun. It is intended to enhance dryfire training by removing the need to cycle the gun. DISCLAIMER: “GLOCK” is a federally registered trademark of Glock, Inc. and is one of many trademarks owned by Glock, Inc. or Glock Ges.m.b.H. GlockETrainer.com is not affiliated with nor endorsed by Glock, Inc. or Glock Ges.m.b.H. Quickly install the Glock E-Trainer to facilitate a more effective dryfire training routine.Without the Glock E-Trainer you have to manually cycle the slide every time you press the trigger in order to reset the trigger. Now, install the Glock E-Trainer in less than 10 seconds and safely dryfire your gun without cycling the slide at all. 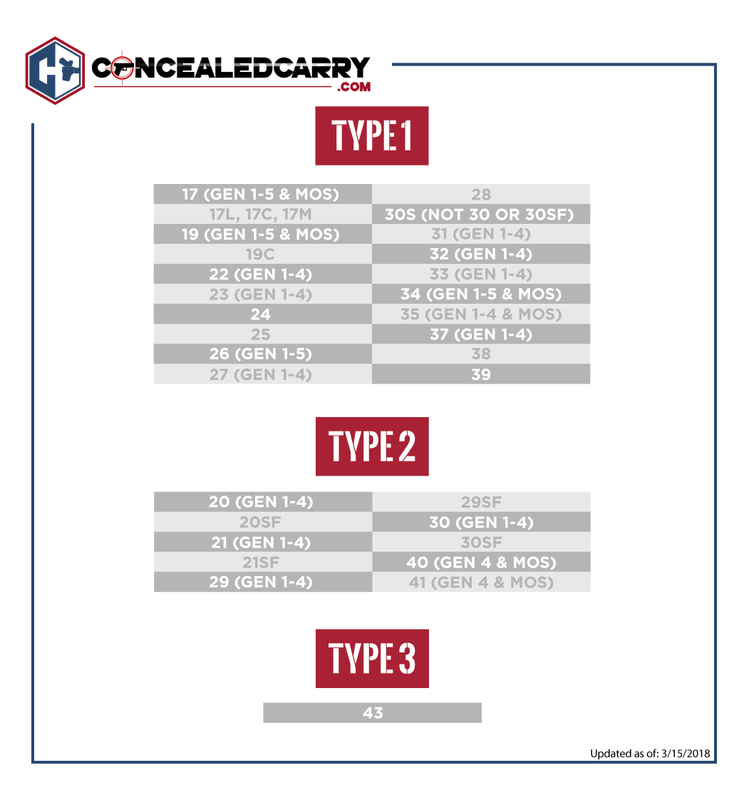 Do You Need Type 1, 2, or 3 of the Glock E-Trainer? Q: Will This Damage My Gun? A: No, it will not. The Glock E-Trainer prevents the firing pin from hitting. Q: Will This Fit My Glock? 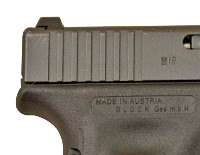 A: There are two versions of the Glock E-Trainer. 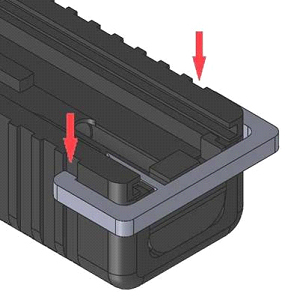 Type 1 fits the majority of Glock pistols. Type 2 fits 11 other models. Type 3 fits the Glock 42 and 43. It will NOT fit on any Glock with gill serrations. Q: Will This Fit Anything Other Than A Glock? Q: Is This A Safety Device? A: While the Glock E-Trainer will prevent the gun from being fired it is not designed to function as a safety device. Firearms should be locked and secured from unauthorized persons. Q: What Exactly Does This Do? 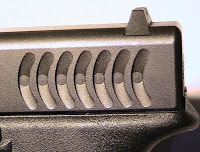 A: The Glock E-Trainer prevents the trigger from releasing the firing pin thus allowing the trigger to return to it's forward position without cycling the gun. Q: Does The Trigger Still “Break”? 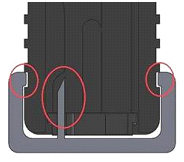 A: No, with the E-Trainer installed the trigger no longer has a takeup, break, and reset. Instead it just moves freely back and forth. It isn't ideal for training trigger reset but allows that one can do dryfire training without cycling the gun. This allows you to still isolate the trigger finger in your training. “GLOCK” is a federally registered trademark of Glock, Inc. and is one of many trademarks owned by Glock, Inc. or Glock Ges.m.b.H. GlockETrainer.com is not affiliated with nor endorsed by Glock, Inc. or Glock Ges.m.b.H. I just received my Glock E-trainer and I couldn’t be happier. Easy to install, very clear instructions. The peace of mind it gives me to know I won’t damage my weapons and the ease with which I can train. I really like the ability to draw, fire and reholster repeatedly without having to rack the slide. 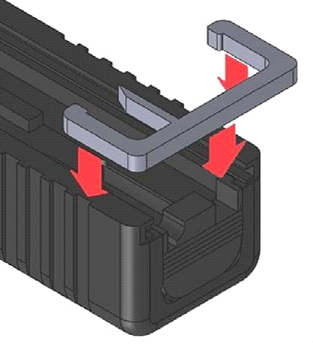 Even magazine changes are easier due to no fear of an accidental discharge. I do use snap caps for safety. 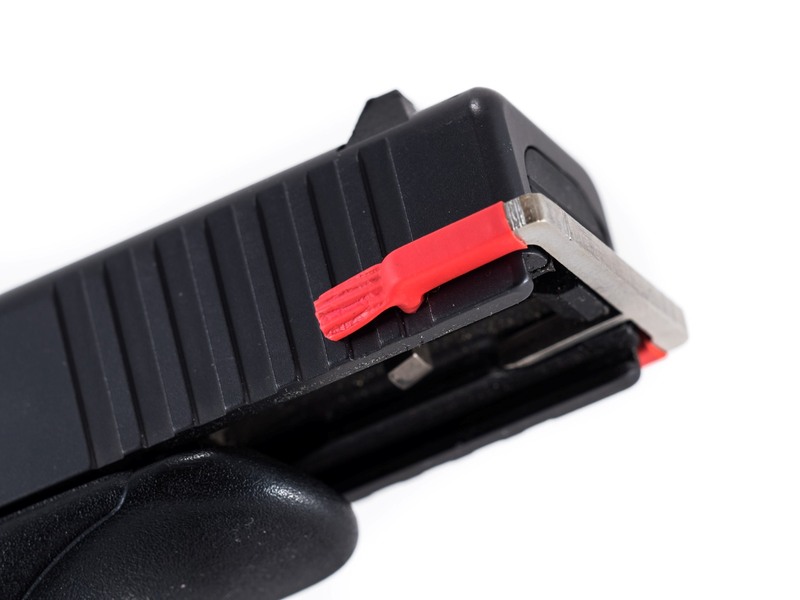 I was thinking about buying a dry fire kit form another manufacturer, but this ingenious little device accomplishes the same thing for one-third the price, and you don’t have to disassemble the gun to install it. With the Glock E-trainer in place, the striker does not release, so there is not an audible click when you press the trigger, but that is a plus for safety. The device is quick and easy to install and remove, and doesn’t get in the way of drawing, sighting, or re-holstering. It is a great product, and I would recommend it for all Glock owners. Here is my honest review of the Glock E-Trainer. It’s over priced. That said I’ve used it in every dry fire session since it arrived. Incredibly easy to install and remove. It provides a three pound trigger pull weight on my primary gun. That’s enough to give a somewhat realistic pull and return trigger movement. I’ve recommended it to two friends and between them they have purchased a of three of them. More than likely that I will purchase another for myself. I have a Glock 23 and the trainer works. No click, just a smooth trigger pull. Worked on first install with no issues. A bit pricey, but it does work. Bright red rubber cover makes it obvious that the trainer is on the gun. A Bit Pricey for what it is. 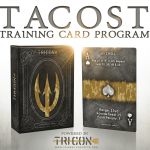 It does provide a good training effect, but again, think the price is a bit to high. Other then that, no issues with it. I was skeptical of the Glock E-Trainer but am always looking for something new to help my shooting. It does work as advertised. Very simple to insert. I noticed it does have a very slight reset feel and a very slight break feel, with no actual hard break. I found it very helpful in training my sight alignment. Over priced? It works and I am happy to add it to my Glock 19 training regimen. I am looking forward to one that will fit my Glock 43. Originally product was backordered. and gave a 2 star review due to the issue surrounding that problem. After seeing how the company fixed the issue I had. I would buy with confidence. For now I will use a friend’s e trainer. Please remove my 2 star review as this is the updated one. Thank you. Thank you for submitting a new review! I checked the shipping info and it looks like yours was delivered a few days ago. Hope you are enjoying the product! I’m always looking to improve my training. The Glock E Trainer has made dry practice very easy. I have recommended the Glock E Trainer to many of my friends. Works exactly as intended, and is very easy to install. One problem that is no fault of the product is that I can’t holster my firearm with it installed as I have a high sweat guard. Customers may want to keep this in mind if they’re ordering it to practice with their draw. I ABSOLUTELY enjoy the Glock E-trainer! It works perfectly! Iespecially like the fact that while it is installed there is NO possible way of accidentally firing a live round! It gives me total peace of mind. But I still don’t aim at live targets, because I don’t want to create a bad habit, which may cause a fatal accident when the trainer is NOT in use! This trainer is Very useful if used with care and common sense. It does what I want it to do with half the price of other’s dryfiring tools!! Awsome!! Helps with trigger control without having to pull the slide back every time, which allows more time concentrating on target!! Helps with teaching my younger ones!! Love this Glock E-trainer!! I recently received my Glock E-Trainer and am very pleased. It works as advertised, and makes dry-fire practice more realistic. It was a bit difficult to install on my Polymer80 upper because the slide serrations are different ,but works great. This is the coolest little invention! It allows me to practice fire all I want, at home, and create “realistic” scenarios for myself. Very easy to install and remove. This will definitely help me build up my confidence in defensive shooting. Does this allow for use of a laser trainer insert? No. 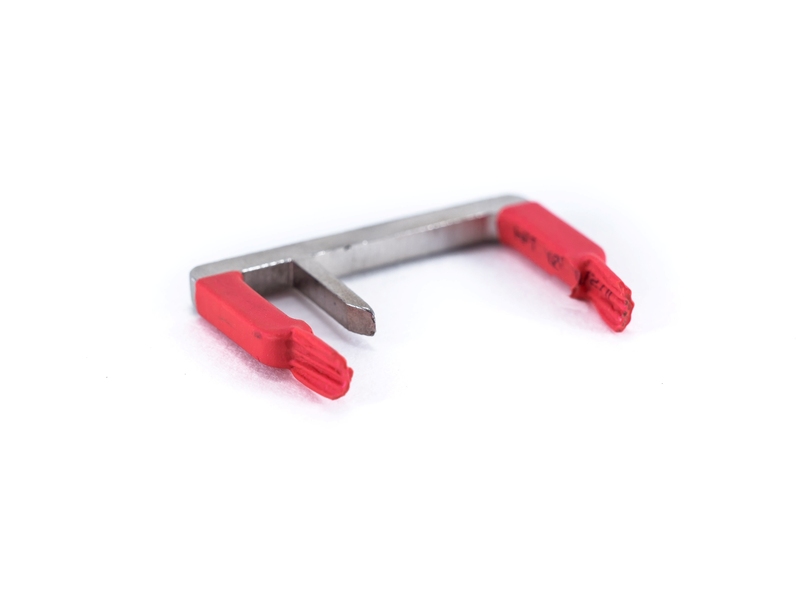 The product prevents the firing pin from coming forward which would prevent it from striking a laser trainer insert. A very good product. I have recommended it already. However, it is a little too pricey. Wish the price was lower. 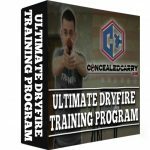 I firmly believe and teach “dry fire” as a vital training technique for anyone who wants consistent accuracy when shooting. This is a very good product for that. I use it in my Glock 17, easily remove the devise, then off to the range I go. In fact, I just did that. I bought the Type 3 trainer for a Glock 43 and 20, which are double stack capable weapons. the “E-trainer” appears to be for a single stack weapon, as it is too narrow to fit the intended slides. The Type 3 is designed specifically and only for the Glock 43. If yours does not fit the Glock 43 it is out of spec or there is some other issue. Either way please contact us so we can take care of it! I’ve been shooting Glock for over 10 years. I have done “Dry Practice” by having to recock the weapon after every shot. Being able to practice with full availability of trigger time is great.